PRODUCT DESCRIPTION: This "kit" comes with a .5% concentrate that is mixed with 12 oz of water and can treat 1 adult large shirt, 1 pair of pants and 1 bed net. 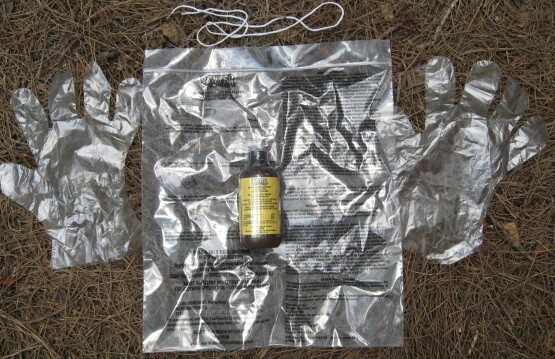 The kit includes the 6 oz jar of concentrate,a resealable soaking bag, a pair of disposable gloves and the securing line used to seal and hang the bag. Clothes should be soaked for 2 hours or more and treatments will last at least through 6 washings of treated garments. The active ingredient, Permethrin, is odorless and safe to use as described. 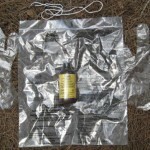 It will effectively repel chiggers, mites, mosquitoes and ticks.